The Cylons were created by Man. They rebelled. They evolved. And they have a plan. The Second Cylon War was over within a day. The Cylons slaughtered billions of humans on the worlds of the Twelve Colonies. Artificial life forms constructed by man, the Cylons re-created themselves into the image of their creators. They look and feel completely human. Some are even programmed to think they are human; sleeper agents unwittingly waiting for the trigger to pursue the Cylon agenda, which is the destruction of the human race. Outgunned and outnumbered, human survivors have no choice but to flee. The ragtag fleet of civilian ships is being guided and protected by the only remaining battleship from the entire colonial military, Battlestar Galactica. Officers and enlisted men and women, politicians and mechanics, children and parents must overcome personal demons and differences on their desperate search for a mythical new home called Earth. 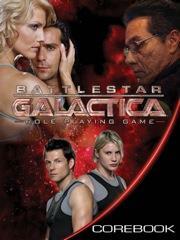 The Battlestar Galactica Role Playing Game brings the action and drama of the hit television series to the game table. Everything you need to start playing is in this book, including full character creation rules, details on the main characters from the show, and information on spaceships, weapons, and tech. The game rules are easy to learn, emphasizing story, action, and character development. All you need are dice, friends, and your imagination! Utilizing the Cortex System featured in the Serenity RPG, the Battlestar Galactica Role-Playing Game re-creates the action, drama, and excitement of the science-fiction universe portrayed in Sci-Fi Channel's Emmy-nominated television series. Leave your d20s behind and play the crew of Battlestar Galactica or all-new characters as they seek to overcome the daily challenges of survival and their own personal demons in the hope of escaping the ruthless, tireless Cylons.